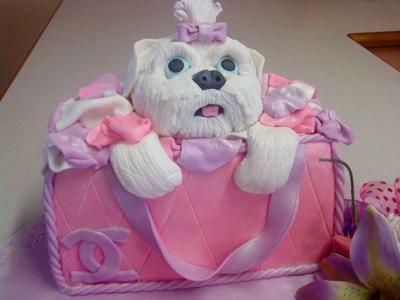 This puppy in a bag cake is a fondant cake. I decorated the puppy in the bag in all icing. The cake has a quilted pattern on the out side. It is done in purple and pink. The inside has tissue paper which is actually fondant icing. Please ask me if you have any questions. Hi found your photo of your Puppy in a bag cake thought it was brilliant, how did you make the puppy ?